We weren't expecting to see it until Star Wars: The Force Awakens, but 20th Century Fox has dropped the X-Men: Apocalypse a little early. Bryan Singer's mutant sequel, set to be released on May 27, 2016, will conclude the trilogy that began with X-Men: First Class. The film will feature the immortal mutant Apocalypse (played by Oscar Isaac), who awakes after thousands of years to decide that mankind needs wiping out. He amasses an army, including Magneto, to bring about the - yep - apocalypse. Enter Charles Xavier and his team of X-Men to try and save humanity. 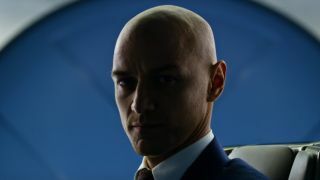 We're also going to see the final part of Xavier's physical transformation into Professor X - check it out below.